The Chanel Cruise 2017 Collection was presented back in May with a Cuban theme, as the show was held at Havana, Cuba. The handbags features a variety of materials such as tweed, toile, wood, macrame and sequins. The iconic Boy and Classic Flap Bags comes in beautiful rainbow colors. Other bags presents the Cuban culture, including a cigar box minaudiere, macrame flap and Coco Cuba printed bags. The collection will be available in stores by November, as we await for it, check out the preview of the upcoming bags and accessories. If you follow me on Instagram you would have already seen the one in Silver, and for tonight’s post here’s your first look at the one in Gold. Aren’t they just Lady Diorbags, you ask? Which are a permanent offering at Dior anyway, so what’s so special about them, right? Well, like the one you saw on IG, they come with an added special. Yes, look closely, do you see the little badges on the sling? Yes folks, these are the new My Lady Dior bags from Dior’s Cruise 2017 collection, and besides being in a new smaller size (20 cm by 17 cm by 9 cm), they are also offered with a trio of enamelled metal badges with each bag purchased. In other words, if you pick up a My Lady Dior, you’ll be able to choose from a wide selection, before deciding on just 3 badges, for your very own customised sling. And no, I wasn’t kidding when I said there would be a wide selection of badges for you to choose from, with the 9 above just the tip of iceberg when it comes to the full selection. From the beloved rose motif to a mini rendition of the Lady Dior, the good news is that you can buy additional badges if you so choose, just to mix it up even more when it comes to the sling. The bad news? These badges can only be used on the shoulder sling, which means you can’t pin it onto your jacket’s lapel or any other bag’s sling due to its locking mechanism. Priced at SGD5200 (which includes the bag and 3 badges), the bags are already available via Dior ION Orchard, Marina Bay Sands and Ngee Ann City, so you’ll just have to decide which colour it will be for you. Gold-tone grained leather? Silver-tone grained leather? Or perhaps the ones in Black or Bright Red lambskin. Now that’s the really hard bit, if you ask me. A new ad campaign has arrived, which gives a sneak peak on the new bags introduced for the Cruise 2017 Collection. So what do we see? Well, all new bags that have been recently introduced are back with new decoration, quilting and hardware. We can feel that Gucci has put a lot of love designing these accessories. The new Gucci GG Marmont Shoulder Bag is made with new Cubic pattern and studs, the Gucci Sylvie Signature Bag in our favorite baby blue shade and printed with summer flowers. Now carry these when entering the rainy and snowy seasons, it will put some smiles on people’s faces – positive fashion! If there’s one thing certain when it comes to the Dior Bag Collection, it is that this luxurious French brand never fails to create one master piece after the other. And this time around with the Dior Cruise 2017 Bag Collection, it made another debut bag that is sure to take the fashion world with a big bang. Ladies, come take a look at the new design of the Lily Bag. Taking its cue from the bowling bag shape, but a better and redefined version, the Lily Bag is the next best thing to own. Its name took its inspiration from the lily-of-the-valley flower, one of Monsieur Dior’s lucky charms. The Lily Bag can be dubbed as an accessory of fresh femininity. Women who are always on the go will absolutely fall in love with it as it can be worn over the hands or over the shoulder. For the 2017 Lily Bag version, we are seeing changes and these are for the better. It comes in a single color grey and it has a new and large signature tag hanging on it. What do you think about this bag, ladies? I know what you are thinking. Why is Bagaholicboy posting something that will traditionally only be available in late December/early January since it is from theCruise 2017 collection? For starters, I’m loving loving loving loving loving (yes, that means love infinity) this bag so so so so so much (yes, you get the idea). The other reason? As far as Gucci is concerned, selected pieces from this collection will be available in Singapore from October 2016, which also means I better start prepping you all on the must-buys from this season. First making its runway debut in London, there isn’t exactly an official name yet so I’m just calling it the Coral Snake Messenger for now. So why do I love it so? Well, here are the reasons. 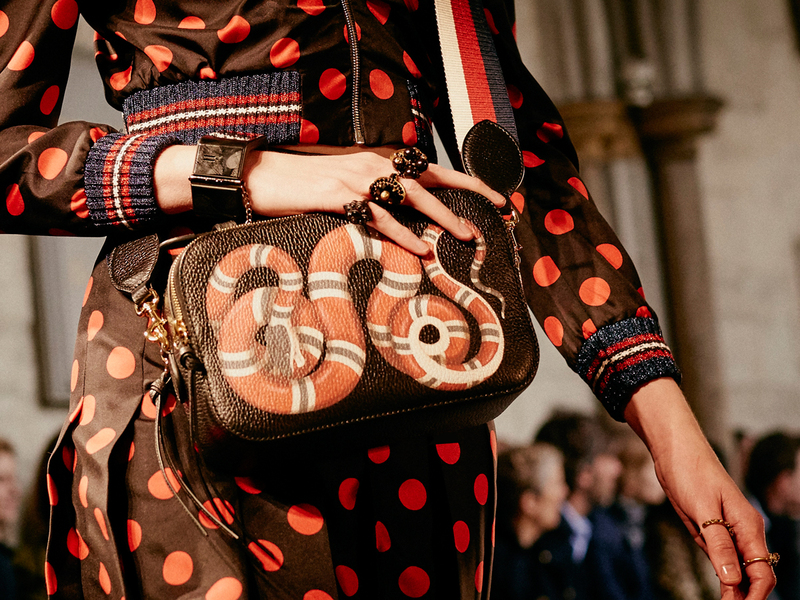 For starters, nothing can beat the amazingly detailed red coral snake on the front of the bag, which almost looks like it was painted on by hand. Well, it’s printed actually, and on a grain leather body no less, which is another big plus for me. Why? Grained leather means it’s naturally hardier and will stand up to scratches better, so it’s something I almost always look for first in any bag. Because I can be a klutz like that. Measuring 29 cm by 19 cm by 11 cm, I also adore its zip-around opening, and the top handle, but the bit that gets me falling hardest has got to be that web sling in blue/red/white that’s just freaking gorgeous. Part of the womens collection, I’ll have no qualms buying it and using it as my own ‘small days’ bag, which should also double-up nicely as a camera bag for my mini DSLR. Not that I own one of those yet, but priorities, right? 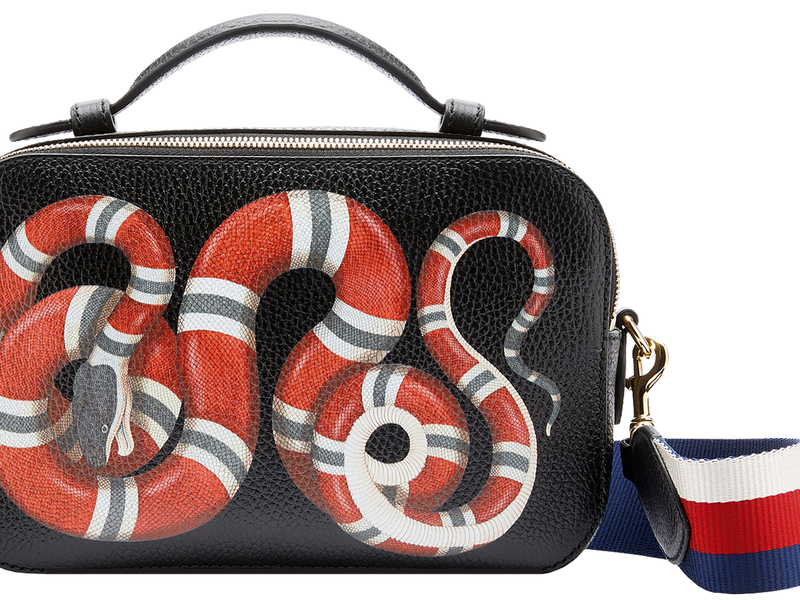 Priced at SGD2350 in Singapore, please march down to Gucci soonest and put yourself on the wait list because I have a feeling once they come in they’ll slither right out.